Before summer is over I wanted to share this great recipe. With summer comes fresh corn, and there are many great ways to eat corn besides on the cobb. 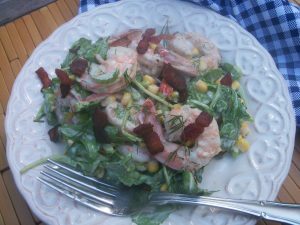 In this incredible summer dish you have crunchy corn, peppery arugula, shrimp, and a creamy dill dressing topped with crispy bacon. Yum! When you are choosing your shrimp, always purchase local shrimp, if this isn’t possible due to your location, investigate where the shrimp is from and make sure it is not farm raised. Enjoy! In a large bowl, whisk together mayonnaise, vinegar, dill, mustard, salt, and pepper. Gently stir in shrimp, arugula, corn, and celery. Top with bacon just before serving. Garnish with dill, if desired. I made this salad for lunch today. It was so good. Nice and fresh. I loved it. I took some over to Connie’s for her dinner when she gets home from work. I just heard from her, she loved it. When I made it this afternoon I didn’t put all the dressing on. I saved some for Connie’s salad and she put it on when she was ready to eat. Another hit Martha. Great, glad you both enjoyed it. She mentioned to me how amazing the dressing tasted, which I agree it is delicious!